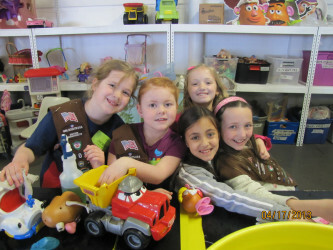 Girl Scouts – A powerful force for good! School groups, National Honor Societies, Boy and Girl Scouts, Church, Temple and Mosque Youth Groups, community clubs, senior’s groups .. the amount and type of groups are endless! A great team building exercise – plus a most perfect Service Learning opportunity. Our capacity for large groups is extraordinary – we can accommodate groups of up to 200 and we’re open six days a week. For every three hours a volunteer spends with us, we are able to help a child with a great “gift package”. Think about the math – Think about the impact – a group of twelve students, spend an afternoon and help 12 local kids who really need the help. If you would like to coordinate a group volunteer visit, please let us know.